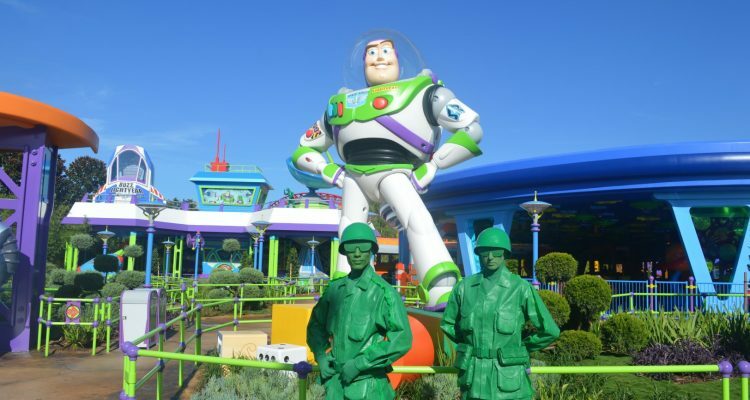 Toy Story Land opens to guests at Disney’s Hollywood Studios on Saturday, but Orlando Rising was a part of a special sneak preview Thursday and its two new attractions. 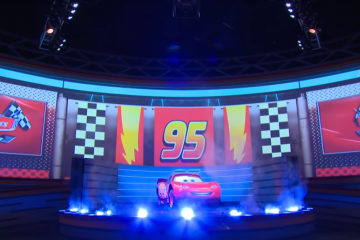 Also featuring a new entrance for Toy Story Mania and a new counter-service restaurant, the land aims to make guests feel like they’re the size of one of the Toy Story toys in Andy’s backyard with no humans around. 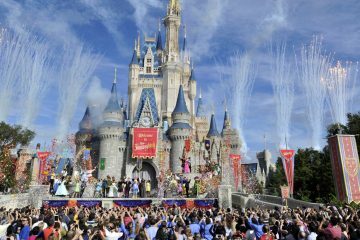 “All the toys around you are playing and when you enter the land, you become an honorary toy as well,” Wilma Colon, Walt Disney World spokesperson, told Orlando Rising. 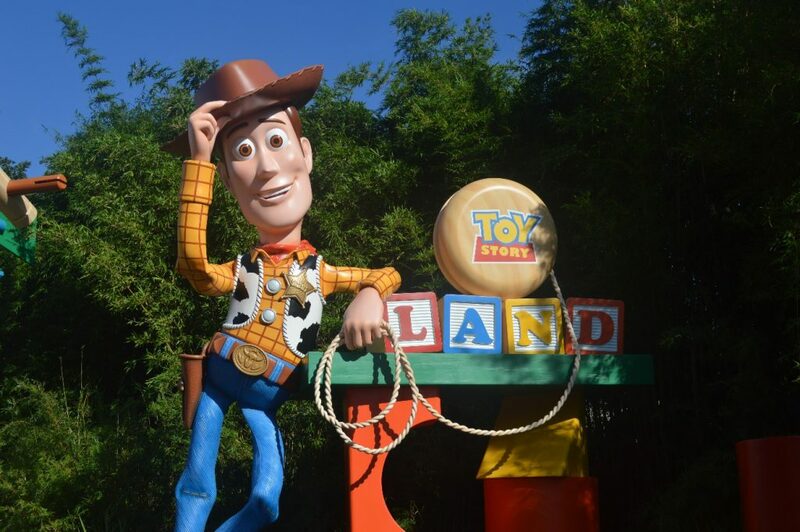 Woody will be the first toy you see entering Toy Story Land. Turning right into Toy Story Land past the soon-to-be-shuttered Pixar Place, guests will first see Woody, leaning on the Toy Story Land sign. Keeping with the “toys in Andy’s backyard” theme, you’ll find large footprints on the dirt-colored pathways and structures made to look like toys or random items strewn across the yard, like Popsicle stick benches and wooden blocks as barricades. 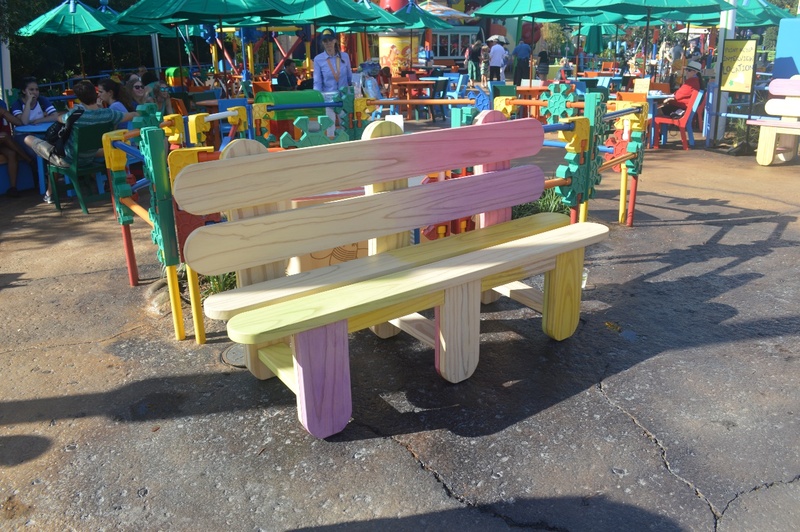 Even the coloring accentuates the Popsicle stick theme on the benches. The first attraction you’ll notice is Slinky Dog Dash, the family roller coaster which weaves throughout much of the 11-acre land. 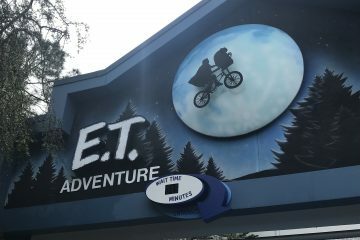 The ride features two powered launches with the whole experience lasting just under two minutes. 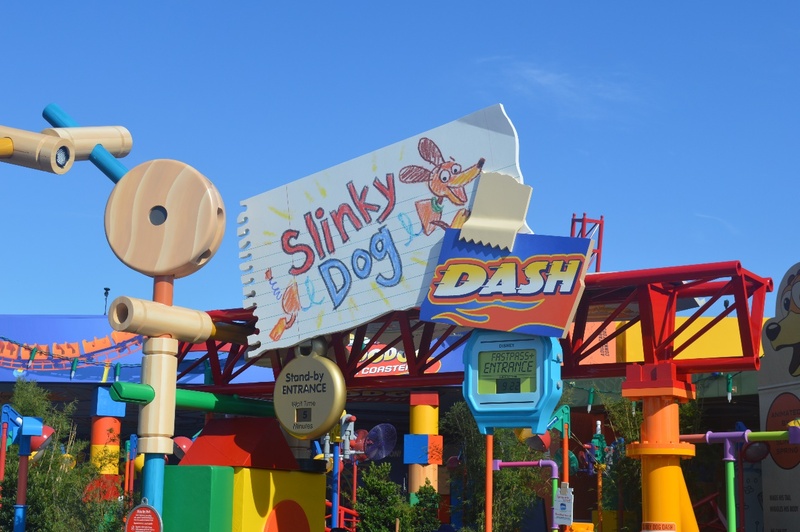 Entrance to Slinky Dog Dash. 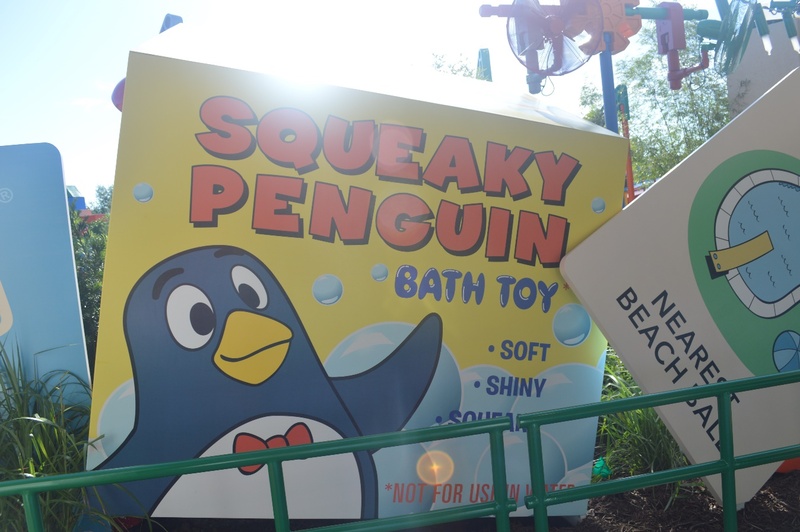 Plenty of other toys are featured in the queues in Toy Story Land. 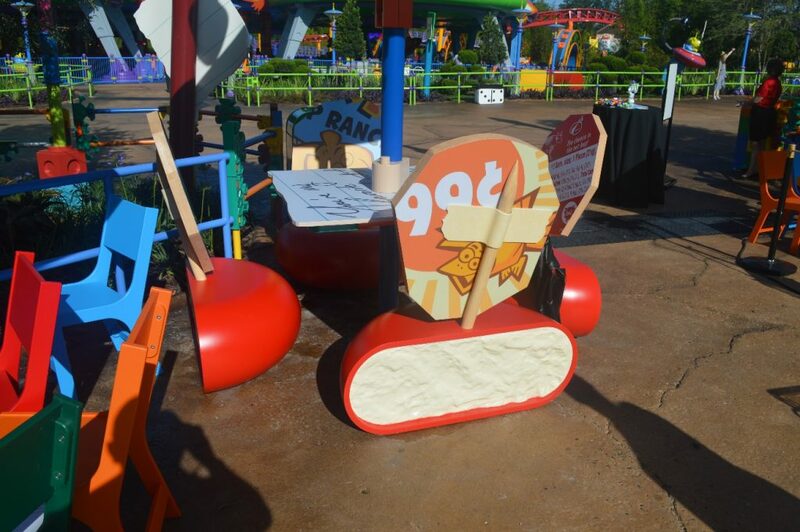 Familiar toys and games are featured at the load area for Slinky Dog Dash. This turn will be one of the first glimpses guests get of Slinky Dog Dash. 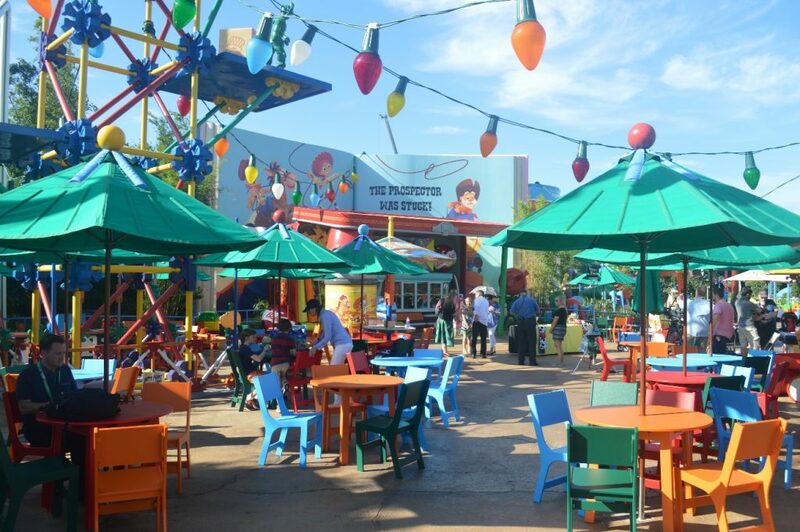 Farther into the land is Woody’s Lunchbox, the only food location in Toy Story Land. Here you’ll find sandwiches, root beer floats and a few alcoholic selections for the adults. 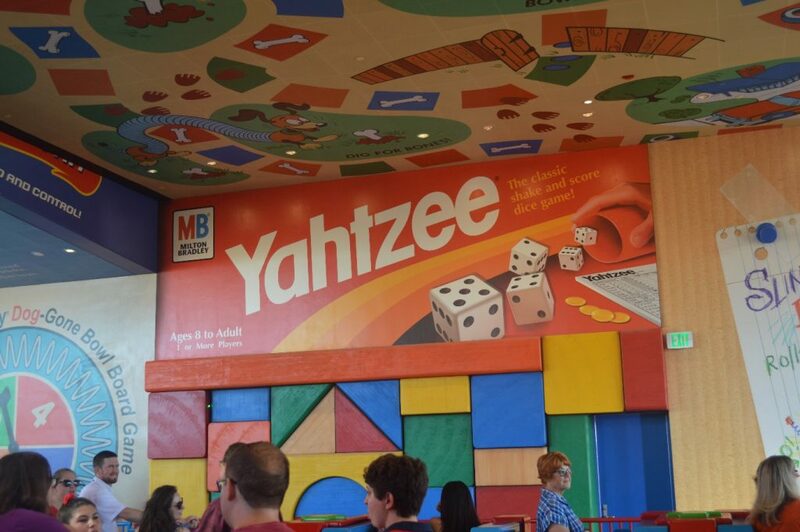 The theme of the land carries over into the outdoor seating section, with Babybel cheese being used for the chairs. The menu at Woody’s Lunchbox. Mini Babybel cheese as seats at Woody’s Lunchbox. 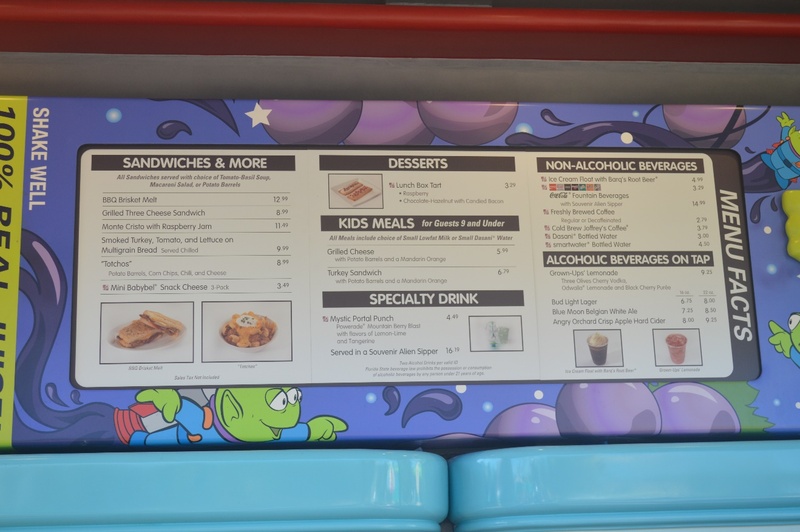 Past Woody’s Lunchbox is the entrance to Alien Swirling Saucers, the other new attraction at Toy Story Land. A spinner-type ride using the same system as Tow Mater’s Junkyard Jamboree at Disney California Adventure, the attraction lasts about 90 seconds and features the little green aliens which have part of Toy Story since the film series began in 1995. 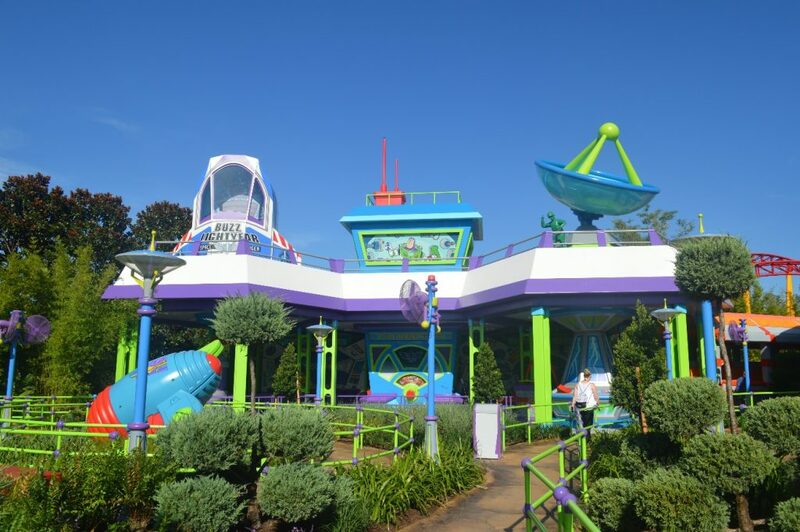 Buzz Lightyear’s spaceship featured in the Alien Swirling Saucers queue. 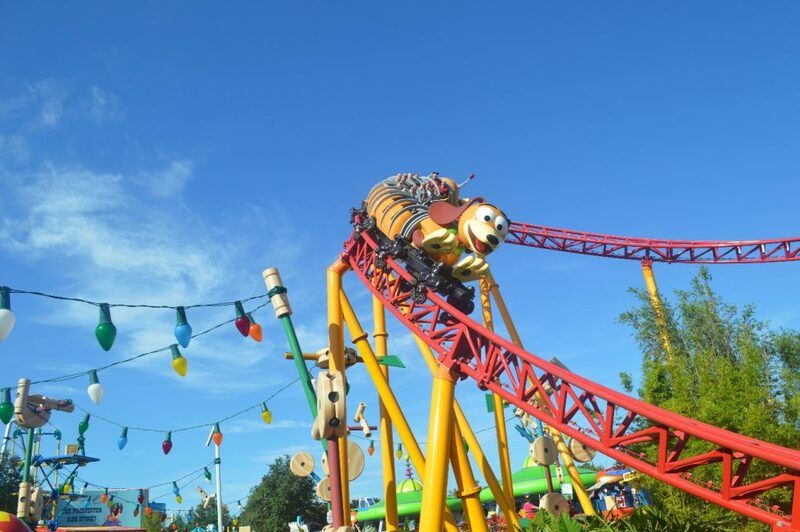 The ride features one of the few shaded areas in Toy Story Land. 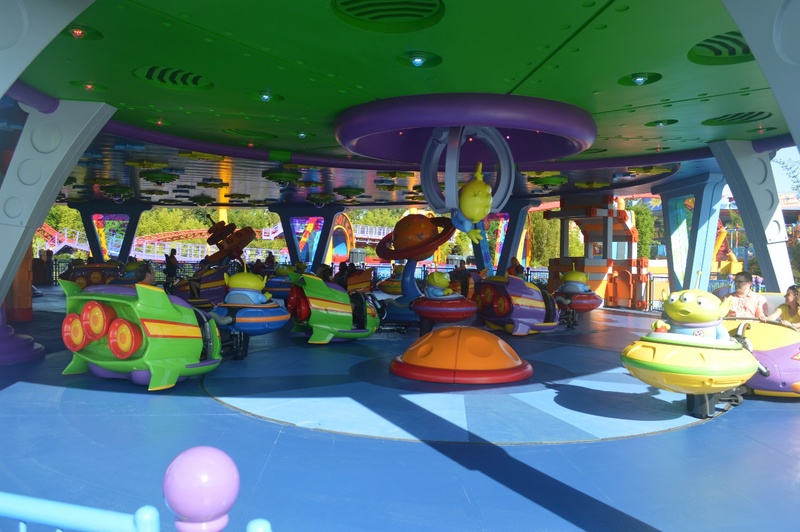 Near Alien Swirling Saucers is where the connection between Toy Story Land and Star Wars: Galaxy’s Edge will be located once the latter section of the park opens in late fall 2019. Star Wars construction is much more visible from this vantage point than from any other area of Disney’s Hollywood Studios. Disney representatives wouldn’t say whether this view will be obstructed before the land’s grand opening. 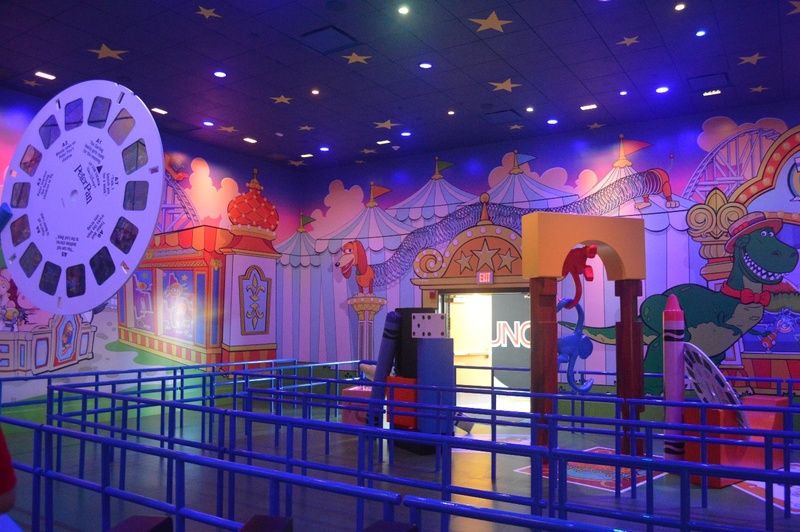 Back toward the front of the new land is the new entrance to Toy Story Mania. Starting June 30, the old entrance in Pixar Place will be shut down and all three tracks of the ride will be open. 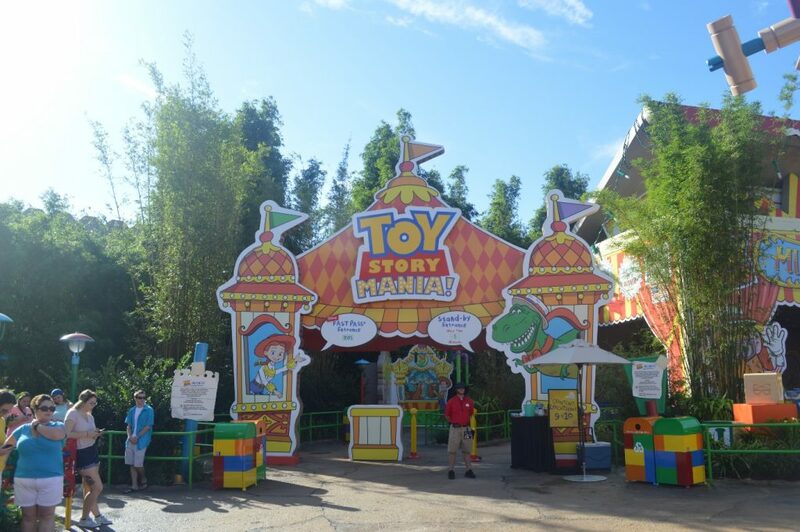 Toy Story Mania’s new entrance. The new queue for Toy Story Mania coming in from Toy Story Land. 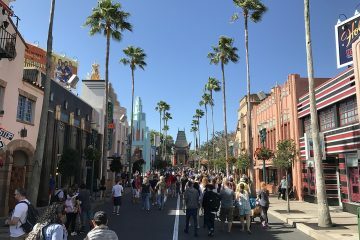 When the general public is welcomed in on June 30, Disney expects big crowds and big waits for all three rides — which represent the biggest step forward in the years-long transformation of Disney’s Hollywood Studios.